I am not a big fan of pasteurized milk, even organic. It just seems like milk flavored water with much of the nutrition and all of the enzymes being killed during the pasteurization process. For several years now we have opted to buy raw milk or make homemade almond milk instead. Both are much healthier and easier on the stomach. Conventional milk is not an option for me in fact as the moment I drink I get dehibilitating stomach aches. To me this means I just shouldn’t be drinking it. First I soak the almonds overnight in water. I do this because I want to deactivate the naturally occurring enzyme inhibitors that prevent the nut from sprouting until conditions are right for growth. By deactivating the inhibitors we have access to the beneficial enzymes that make the nut a living food. After soaking I rinse the nuts and put them in a high speed blender along with 6 cups of filtered water. I recommend a Vita-Mix or a Blendtec for the best milk. I have both and they are equally awesome. Blend until smooth and creamy and then strain the milk through a cheesecloth to get rid of the brown almond skins and any leftover chunks. I end up having to really squeeze the cheesecloth to get the milk out. 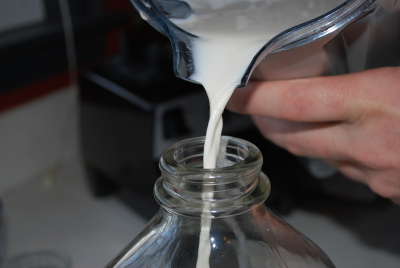 Then I pour the milk into a glass milk jug and put it in the refrigerator and we try to use it up within 4-5 days. We usually never have a problem drinking it all! I also take the leftover pulp from the cheesecloth and spread it out on a dehydrater sheet and I dehydrate for several hours until it is dry and flaky. Then it goes back into the blender to be crushed into almond flour for other menu items. Mmmmmm… we LOVE almond milk. And it’s so easy to make chocolate with the addition of cocoa powder and agave nectar! I have the same question as Jennifer! Since you gave a specific quantity of water to add, how many almonds are for 6 cups of water? Oh, and I love the idea of drying out the ‘remains’ and using it for almond flour!! I *wish* I could get raw milk here. It’s just not available, not even direct from farmers (at least not that I’ve found). I don’t even know if I’d like it, but I want to at least try it. Do you get your stomachaches with raw milk too, or just pasteurized? I have some lactose intolerance issues, so I know about gut problems from milk… but I would assume that lactose is lactose, and is not one of the things that would change between raw and pasteurized milk. Raw milk contains all the natural enzymes to break down the lactose in it – pasteurization kills all those natural, live enzymes. So … raw milk is often tolerated by the lactose intolerant and can even help you process non-raw milk cheeses in your body. 2 cups of almonds per 6 cups of water is the ratio I use. Yum! I will try it out with my kids! But can you do anything with the water that the almonds were soaked in or the rinse water? You should try finding raw (unpasteurized, non-homogenized) whole cow’s milk, or even better goat’s milk. Usually you have to buy it from the farm. Many “lactose intolerant” people have great success on raw milk. Goat’s milk has a larger fat molecule and is easier to digest. Do you wash the cheese cloth after you use it every time and if so, do you wash it in a clothes washer or by hand? I was thinking that it would be difficult to keep it sterile/germ free. one suggestion when u soak the almonds over night in the water u can remove the skin or shell before u put them in the blender. that way u wouldnt have to strain them afterwards. my question is what are some uses for the pulp or skins of the almonds? i figure there must be some nutrients in there. Thank you so very much for this recipe. I used the leftover pulp in my homemade body scrub, but I will try the flour idea! Can you tell me if homemade almond milk would contain all of the same nutritional benefits found in the store bought almond milk? I think the store bought almond milk is fortified? I want to be sure that my 3-year old son and I (both lactose intolerant) are choosing the best milk alternative. Thanks! Fortified foods are not as good for you as eating whole foods to get your vitamins and minerals. It is like taking vitamins.